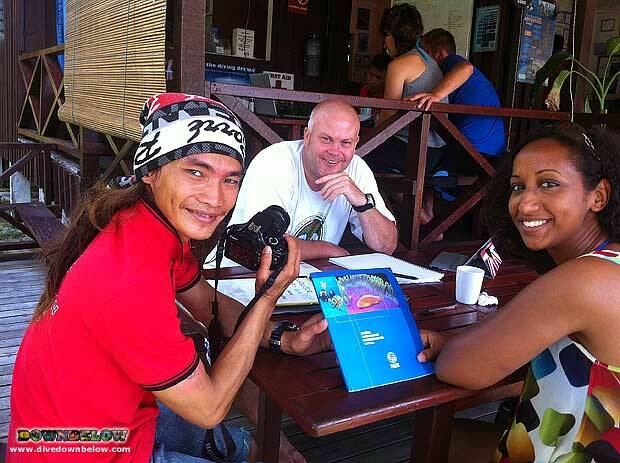 Tim, Majda and Martin share their interest in PADI Digital Underwater Photography! Home/News, Professional Diving Internships/Tim, Majda and Martin share their interest in PADI Digital Underwater Photography! Many divers keep diving to view the beautiful marine life and Go PRO divers are the same! PADI IDC Staff Instructor Tim, teaches a very popular course, PADI Digital Underwater Photography to his PADI Divemaster student Majda, and our lucky MSDT intern Martin tags along for great tips from Tim! Majda is continuing her dive education with her mentor Tim on the course to develop her photography skills, and of course capture her awesome scuba diving memories. Underwater photography needs practise, as do other scuba diving disciplines! We have introduced a promotion to combine both PADI Digital Underwater Photography Specialty and PADI Peak Performance Buoyancy Specialty, to encourage new divers to continue their education. Good buoyancy skills will expose beautiful photography! Contact one of our experienced Head Office team to provide you with a suitable program to continue your dive education at our premier PADI 5 Star IDC beach house on Gaya Island! By Joanne Swann|2014-02-28T16:33:02+08:00March 2nd, 2014|News, Professional Diving Internships|Comments Off on Tim, Majda and Martin share their interest in PADI Digital Underwater Photography!